« Whither Goes the Volatility Index – VIX? A VIX reading of 24.10 from its then current reading of 23.46. It came within a hairs-breadth of that and then fell back. Therefore, it did not breakout above its Bollinger Band Bandwidth, and hence no cigar for the Bears. The second requirement was a 0.24 % B 1-Day Chg to the Upside which would have the Bears Dancing…wasn’t going to happen after it failed the first test, above. The most exciting one is a -0.24 %B 1-Dy Chg to the Downside, which spells a Little Kahuna which would have the Bulls Prancing. I have news for you…it hit -0.21 yesterday which is close enough for Government Work, and so the Bulls danced and pranced yesterday and they breathe a sigh of relief for now based on the INTC and IBM Earnings Reports. You will note that the VIX is close to the Lower Bollinger Band at this point, and the bulls are looking for it to either break it further to the downside or at least stay dormant. If it bounces from here…well you know the drill from here by now. So the good news is that the Bear Market Rally is for the time being still intact and of course, you all know that the favorite Wolf Packs of Chemical Specialty, Solars, Agriculture and Steels are all trotting higher. One of our newbies said he didn’t know what a Wolf Pack is? That’s surprising when we have talked about them throughout this blog. Just look at the performance of the JIRM Index which I put up for you on this blog two weeks ago and you will see those are the types of stocks to be in right now. With INTC and IBM both clearing away the gloom and doom of GE’s EPS report, the Market is in the HGS Investor’s sweet spot. So much for the good news and it seems that this market wants to go up despite all the gloom and doom of a recession, the price of gas and also food, the weak dollar, and a litany of other things. Then as the saying goes, the Market climbs a Wall of Fear. Please understand that we are by no means out of the quagmire as yet and have only barely scratched the surface on the return journey for the Major Market Indexes. If the flood of Earnings Reports continues to give Upward Surprises for the next two weeks, we may have a chance of a decent Bear Market Rally going into the summer doldrums when all of Wall Street go off to the Hampton’s for their weddings, graduations and vacations. But setting all of that aside, I caution you to return to the Mark Pharr Chart as your guide for the longer term. You will find it amply displayed and discussed on this blog and of course in the Newsletter. We have only accomplished the first of the goals I set, which was the %B must first climb above its bandwidth on a 40-week Chart. It needs to get well above the middle Bollinger Band before we are in the all clear and out of the woods for the longer term players to take comfort on a New Bull Rally. Of course, Type 1, 2, and 3, day and swing traders can play to their hearts content until we get the next negative surprise and knee jerk downwards. 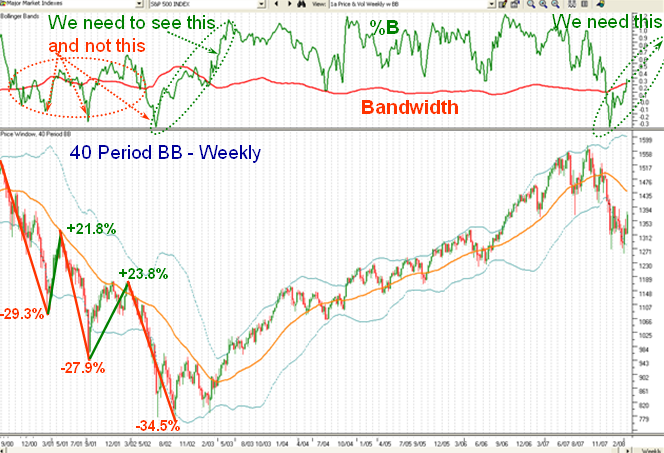 The most important point will be when %B hits the middle Bollinger Band, as that is the time which will be most telling and will either prance through or as expected will fall back for one more test of the lows before we can determine whether we have already found the bottom in the market or that we go one more leg down. Here is the chart I gave you before and it has hardly changed, so work with this one. The Index must first get to the Orange Line before the real test begins. In the mean time there is good money to be made and the sun is shining on the Bulls at this point in time, so enjoy making money while you can to the upside. 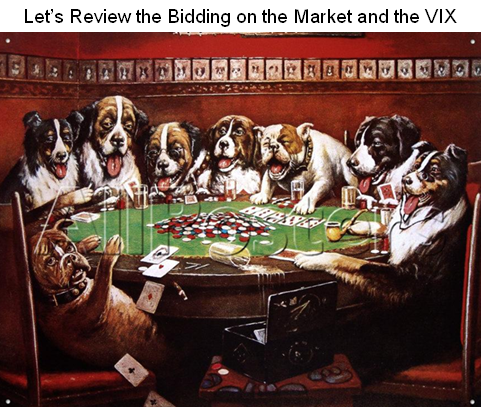 This entry was posted on Thursday, April 17th, 2008 at 11:31 am	and is filed under HGS Principles, Market Analysis. You can follow any responses to this entry through the RSS 2.0 feed. Both comments and pings are currently closed.